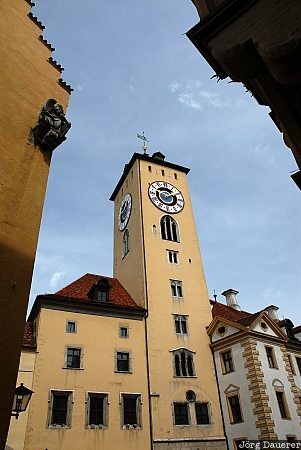 The tower of the old city hall (Altes Rathaus) of Regensburg in front of a blue sky. Regensburg is the capital of Upper Palatinate (Oberpfalz) in the east of Bavaria, Germany. This photo was taken at noon on a cloudy day in April of 2006. This photo was taken with a digital camera.